We are calling it Spring Storm Bobby. It came here on my brother Bobby's 61st birthday anniversary. 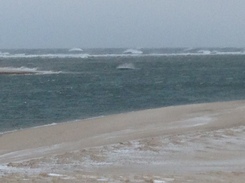 Some pictures from Chatham, Mass of the Atlantic Ocean pounding the Outer Beach of Cape Cod near Chatham Inlet. View of Chatham Inlet from the bluff in front of the lighthouse. 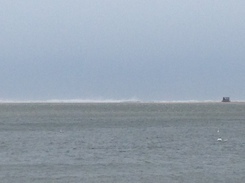 Surf could be seen breaking almost a mile offshore. View from the beach at Cow Yard Lane in Chatham. 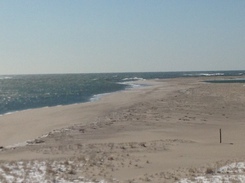 The surf was clearly visible over the tops of the dunes. Normally, we can hear the surf but not see it. Chatham Inlet view the day after. The Inlet looks to be in the same place it was yesterday and is not obviously choked with sand.